But I can’t deny the fact that the average Thai-Malay ‘warung’ (food stalls) do not appeal to me much. Aside from Waritha on Gopeng Road which I had an unforgettable experience late last year (in a not so positive manner), I have never written about the many “Ikan Bakar-Thai Tom Yam-Nasi Berlauk” outlets in Ipoh. Curry Assam Fish Head – A favourite across the racial horizons; Chinese cook it the Nyonya way, Indians with a more pungent and robust curry flavour, and Malays have their Salim outlets. But then again, do you know that there are WAY more halal (and for most outlets; pork-free) solutions than the generic fares from the many ‘warung’? How about C U Village nyonya food (Halal), Koh Samui Thai food (Halal), Laksamana Cheng Ho (Muslim-Chinese food – Halal), Pakeeza North Indian Cuisine, Yum Yum, Kim Bali, 1919 Restaurant & Gallery (Pork-free), and many more. Which was a dazzling chance for Motormouth to pick ANY restaurant in Ipoh serving Halal food (within the budget of the organization, of course), and choosing the dishes without pressure. After all, this would be a terrific opportunity for the Malay colleagues to sample the Chinese way of cooking Nyonya-Chinese cuisine. Hence after serious deliberation (and constant bickering/running around/crossing swords), Assam House in Medan Gopeng was chosen. A fairly new outlet, this restaurant is situated next to the Medan Gopeng Bus Station in Ipoh, a short distance away from the famous Sam Poh Tong caves. 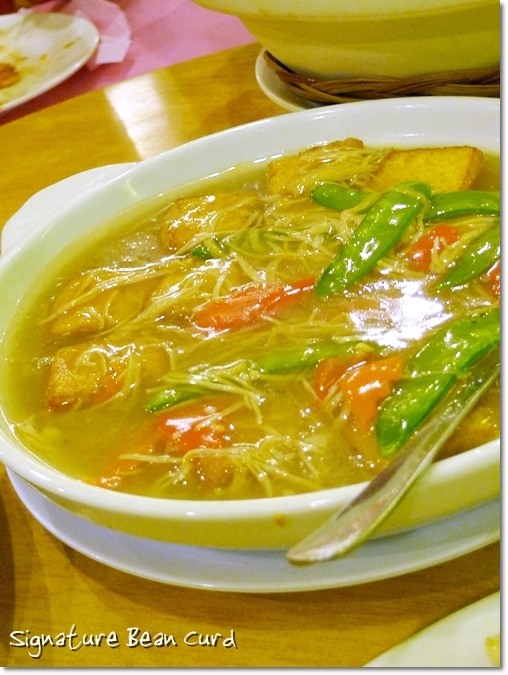 Home-Made Bean Curd Delight – Such a simple dish, yet this got many of my Malay colleagues raving. First time trying the egg tofu braised in a delish gravy? A set for 10 came to RM200/USD60.60 after much bargaining with a nice, affable chap; Mr Loh. 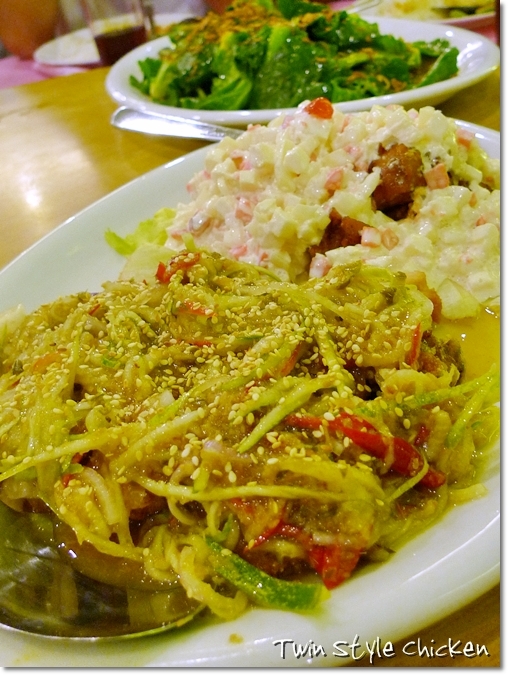 Most of the dishes were good, as expected with minor misses here and there. 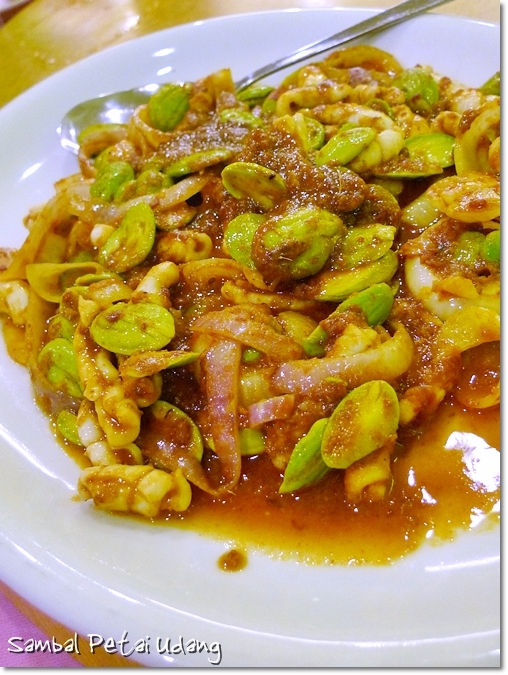 The petai (stinkbeans) with squids and curry fish head were the perfect dishes to introduce your Malay friends to Chinese-Nyonya cuisine; with the former being different from the usually more fiery sambal (chili paste) used in Malay dishes. The other dishes were passable, but managed to get nods of approval from the other diners. The set came with rice, herbal tea, and fresh fruits as desserts. For smaller groups, Assam House offers sets for such number of pax (2,4,6,8,10,12 …). By the way, I am still not sure about the story of Assam House and Kim Bali. Previously all their outlets were known as Assam House; but then the original branch on Osbourne Road (Jalan Dato Tahwil Azhar) has changed to Kim Bali, and opened another branch in First Garden. Anyone cares to shed some light on this? Wow, more reasons for me to head towards Penang this weekend. Hahaha … I thought you were about to puke pulak …. I love Malay food, the flavours, the spices and everything else about it. How does something so simple like nasi lemak taste so good? But I’m not that big a fan of warung food, mostly because I don’t know where the good ones are. Not really simple, if you give it some thought. You have to get the fluffy texture of the nasi lemak right, with strong whiff of pandan and santan. Then the sambal MUST be a killer, with the right balance of sweetness, spiciness and a little sour. The Sambal Petai must be very delicious le! 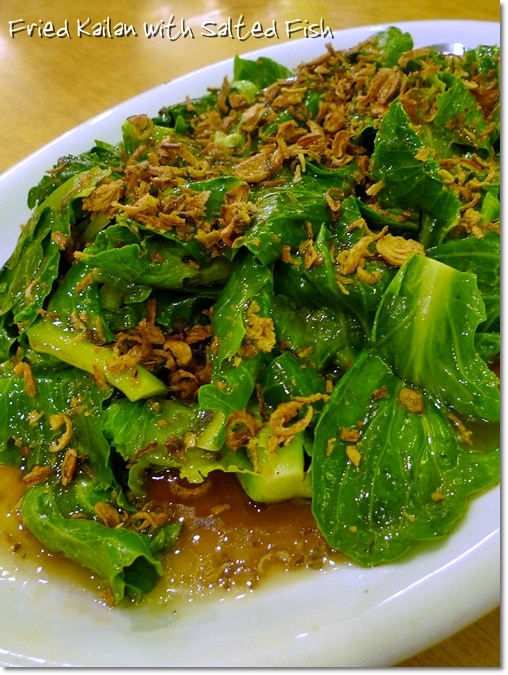 M no.1 petai fans….hehe! I always pass by this restaurant on my way back to my Ipoh house. So it’s operated by a chinese eh? Food looks good! Yeah, started by a lady, if I’m not mistaken. Rich legacy, started way back in the 90’s. Famous VIP’s such as Chow Yun Fatt visited the restaurant way back when they were filming Anna And The King (correct me if I’m wrong) hence this restaurant’s name has been emblazoned across the media for years. Tempted right? Petai’s a perennial favourite of my family’s. Been crunching on them since I was a kid. those Petai looks a bit overcooked but it’s one of my fave dish. Nope, they looked soggy and shrunken but actually quite crunchy and complemented perfectly by the squids (actually, supposed to be ‘sotong’, not ‘udang’ … my mistake in the first picture). 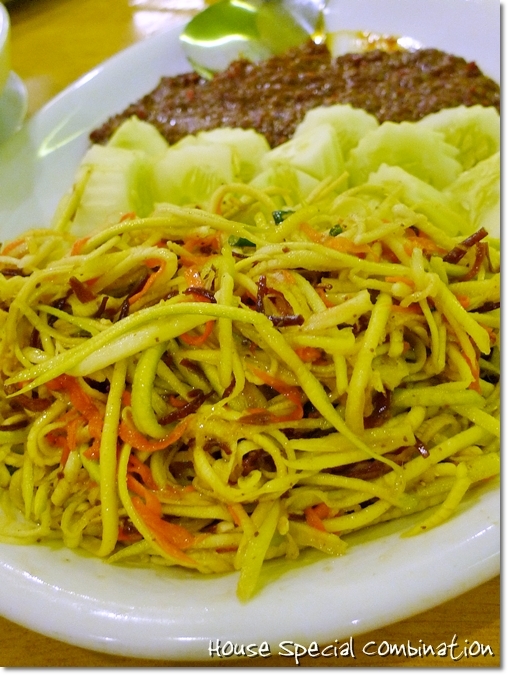 Did ur Malay colleagues impressed with the Chinese cooking style which more variety than the Malay cooking style? YES! Absolutely. 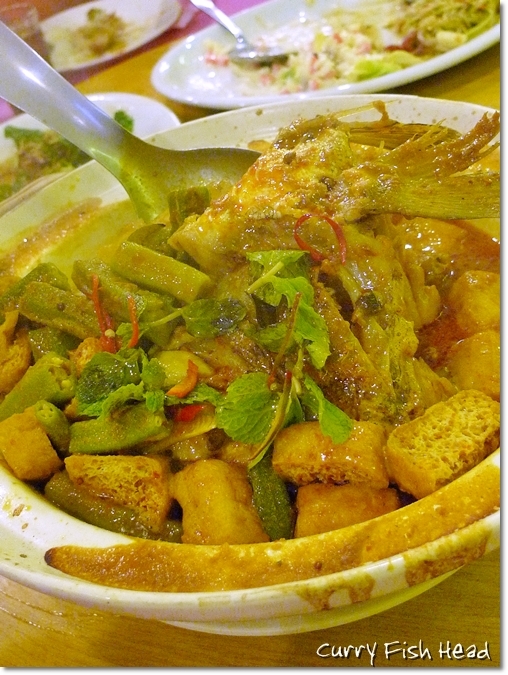 They were impressed by the curry asam fish head, sambal petai, and even the beancurd! Surprise, surprise. Yum! Yum! I can always count on you to make me feel hungry. I love to come to your site. Kim Bali and Assam House are operated by siblings. The former is non-halal while the latter are halal. That’s why they are named differently.